We are now accepting job applications for several positions at English Mountain Recovery. We are delighted you are interested in joining our dedicated and enthusiastic staff. If we find you meet our minimum qualifications, you should be hearing from us to continue the candidate process of employment. Thank you for your interest in English Mountain Recovery! Program Counselors are responsible for case management services for clients at the facility, and have regular contact with referral sources and families. Helps the clients identify issues for treatment and after care plans and oversees the implementation and completion of treatment plans prior to discharge. Facilitates education and process group counseling sessions and performs individual group counseling sessions per program requirements. Makes referrals and follow up appointments with clients for after care. Other duties as assigned by the clinical director. We are always accepting applications for future vacancies and new positions. If you are interested in exploring this incredible opportunity in the Smoky Mountains, please contact at info@englishmountain.com. English Mountain Recovery offers competitive compensation and a full benefit package. English Mountain Recovery (EMR) is a 36 bed treatment facility located in the Smoky Mountains of East Tennessee. Set on a serene 27 acre campus, EMR joins hands with nature’s perfect setting to provide an environment where lives can be transformed. We are dedicated to providing the highest quality of recovery services to individuals and their families at the most affordable costs. We are committed to client service, while emphasizing a spiritual foundation, true to the original foundation of the 12 Step Program. Our minimum 90 day program offers a full range of treatment modalities. 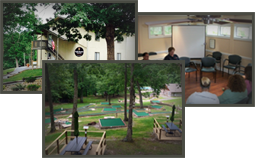 Located in the beautiful Smoky Mountain region of Tennessee, English Mountain Recovery is a 36 bed residential facility with a with a minimum 90 day treatment program. We are committed to providing exceptional care to our patients in a supportive and nurturing environment. English Mountain Recovery’s full range of treatment modalities includes 12 Step Philosophy, Equine Interaction Experience, EMDR, acupuncture, tapping, experiential and adventure therapies, expressive arts, spiritual consultations, relapse prevention and a dynamic Family Program. English Mountain Recovery strives to create lifetime relationships for long-term recovery.